We offer our guests a choice of eight en-suite rooms (four double/twin, two one-bedroom suites and our recently completed two-bedroom cottage suite – The Bothy) with full facilities as well as a residents’ lounge with fully stocked bar, restaurant, BBQ hut, outside bar, spa/treatment room, hot tub and golf facilities including club storage, drying room, practice bunker and putting green. As part of our recent refurbishment, we have taken the opportunity to introduce some traditional Scottish features including the Garleton Lodge tartan and stag, artwork by local artists and our own whisky ‘flight’ with each of our guest rooms named after one of the distilleries in each of the Scotch whisky regions. Our residents’ lounge and bar is also named after our nearby distillery, Glenkinchie, with whom we have a close working relationship. We have further exciting additions proposed in 2019 – please sign up to our newsletter for updates and further news. 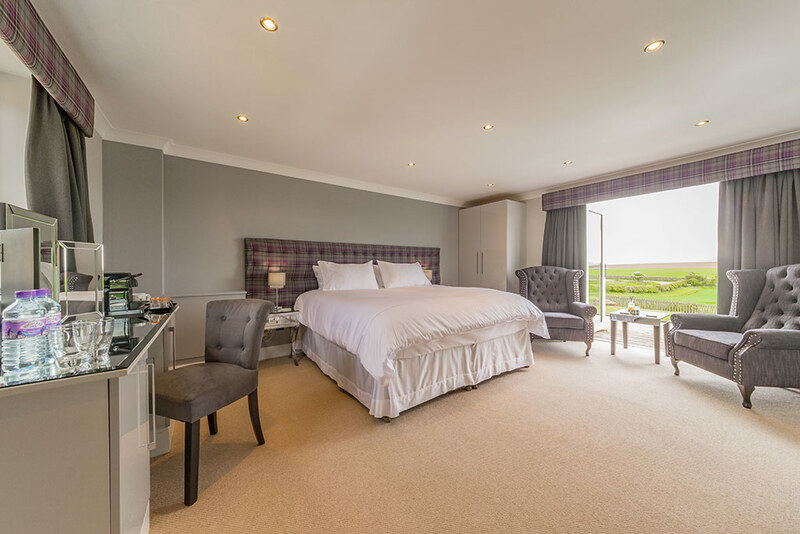 Our four double/twin rooms (Aberlour, Jura, Glengoyne and Springbank) are spacious and well equipped and each has an outside terrace area from which you can enjoy far reaching views across unspoilt countryside. Our two loft suites (Auchentoshan and Bruichladdich) have their own separate external entrance from our courtyard and are large, light & airy with flexibility to offer an intimate suite experience or to accommodate larger parties including golf groups – each comfortably sleeps up to four guests. Our hilltop setting provides guests with stunning 360 degree views across the Firth of Forth, Edinburgh, the Lammermuir Hills and the East Lothian countryside. If you have any special requests or dietary requirements please let us know and we will try to accommodate. Our cottage (The Bothy) is situated adjacent to Garleton Lodge and provides a two-bedroom suite with its own entrance from our courtyard as well as an outside terrace area from which you can enjoy far reaching views across unspoilt countryside whilst sampling our in-room service. Guests in The Bothy can make use of all our facilities whilst also having the benefit of their own private lounge. Garleton Lodge guests are welcome to use our residents’ lounge with fully stocked bar as well as our restaurant, BBQ hut, outside bar, spa/treatment room, hot tub and golf facilities including practice bunker and putting green. We have a large hot tub on our decking area taking full advantage of our hilltop setting and panoramic views. We offer massage therapy as well as manicure and pedicure spa treatments by prior arrangement. We can arrange to collect/drop off from Edinburgh airport – by prior arrangement. We have a Finnish BBQ hut which comfortably seats 12 people. We have golf facilities including practice bunker and putting green, golf club storage and drying room. As part of our golf packages we offer a shuttle to/from local golf courses – by prior arrangement. Our bar (Glenkinchie Lounge) is accredited by The Whisky Ambassador and offers a wide range of whisky and gin including examples from local distilleries in our comfortable residents’ lounge. Guests can enjoy an excellent menu using many local ingredients. Check our sample menus, wine, whisky and cocktails lists here. Were lucky enough to be one of the first people to get to stay at Garleton Lodge after the new owners had finished their renovations - they did a fantastic job as it really is five star. Garleton Lodge hosted our golf club Annual Christmas Dinner 2016. Comfortable surroundings, great food and really friendly staff led by Angela who is a magnificent chef. Phil C, Longniddry, ScotlandGreat to have such a venue available locally. Only 25 minutes from Edinburgh and we were right in the country surrounded by fields and with the most spectacular views over the Forth. Our stay truly was amazing. Nick J, Glasgow, ScotlandWe’ll be back!